I have long been a fan of EO (Essential Oil) products. I discovered EO when I was searching Environmental Working Group’s cosmetic database Skin Deep for products that would not irritate my son’s sensitive skin. EO was the answer, as they never use irritating sodium lauryl or laureth sulfates, and I quickly adopted the products into my preschool classroom, as well. EO Hand Soap, French Lavender: Naturally antiseptic & gentle with pure essential oils & plant extracts. Lavender fields forever. Lavender is revered as the most versatile and widely used of all the essential oils. It has a long history of use because of its medicinal & therapeutic properties. EO Hand Soap, Unscented: Our extremely mild and richly foaming formula deeply cleanses and nourishes even the most sensitive skin with pure and soothing botanicals. Rich Organic Coconut Milk nurtures and soothes skin. EO Hand Sanitizer Gel Lemon : Sanitizes and moisturizes with 62% organic alcohol. The organic way to clean your hands and stay healthy. Picture this, there were two hands and zillions of germs. Each hand busy, doing all of the things of the day and zillions of germs trying to stay involved in whatever is going on. Using EO hand sanitizer keeps both hands refreshed, healthy and clean while keeping germs out of the picture. EO hand sanitizer – the organic, plant – based alternative to chemical laden hand sanitizers. Unscented hand sanitizer cleanses naturally – scent free. Organic alcohol (non – GMO) sanitizers on contact. Soothing jojoba oil nourishes and moisturizes. Not tested on animals. Choose wisely! No synthetic fragrances, only pure essential oils. Love life. Live clean. Be mindful of what you put on and in your body. EO Products Hand Sanitizer Spray Organic Lavender: EO® Lavender Hand Sanitizer with Echinacea is the organic plant based alternative to chemical laden hand sanitizers. Organic Lavender Essential Oil is naturally antiseptic with anti-microbial benefits. Fragrant and soothing, it delivers 62% Organic Alcohol (non-GMO) to sanitize hands. EO Cleansing Hand Wipes, Lavender: Cleans & Sanitizes on the Go! EO Natural Cleansing Wipes are made from bamboo cloth moistened with pure Essential Oils and Organic Aloe Vera to cleanse and moisturize gently and naturally. The EO Cleansing Wipes are the Organic, plant-based alternative to chemical laden wipes. EO Bamboo wipes are made from nature’s most sustainable resource and grown without pesticides or chemicals. These wipes are 100% biodegradable and will naturally break down in soil from a combination of microorganisms and sunshine. With pure therapeutic Lavender Essential Oils, EO wipes help soothe the skin and cleanse naturally. EO Bath Remedies Bubble Bath, Time Out: Relax your body, change your mind. Visualize yourself on a warm, sunny tropical beach with the gentle breeze blowing lightly. Smell the fragrant air with hints of coconut, vanilla and tangerine….it’s time for an attitude adjustment and a miracle. EO Unscented with Coconut Milk Everyday Body Lotion: A nourishing and protective moisturizer that applies easily and is quickly absorbed leaving skin smooth and soft. 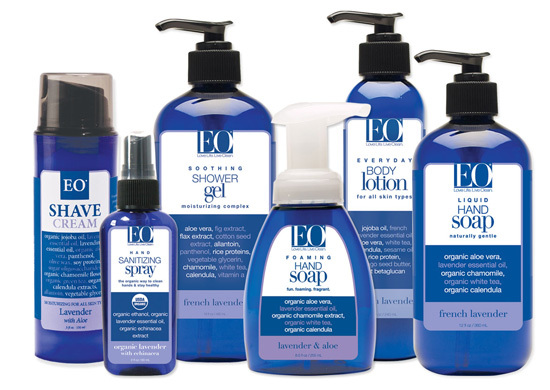 EO’s gentle and unscented formulation hydrates and soothes even the most delicate skin. EO’s Body Lotions contain: – Rice proteins that penetrate deeply to diminish fine lines – Vitamins E and A to improve skin elasticity – Mango seed butter and olive wax to moisturize and protect – organic jojoba oil lightly conditions skin restoring softness naturally – Organic calendula, chamomile and white tea botanicals harmonize and nourish skin. EO Chocolate & Mint Body Lotion: A nourishing and protective moisturizer that applies easily and is quickly absorbed leaving skin smooth and soft. Cocoa Absolute and Mint combine to comfort and refresh. EO’s Body Lotions contain: – Rice proteins that penetrate deeply to diminish fine lines – Vitamins E and A to improve skin elasticity – Mango seed butter and olive wax to moisturize and protect – organic jojoba oil lightly conditions skin restoring softness naturally – Organic calendula, chamomile and white tea botanicals harmonize and nourish skin. EO Shower Gel Citrus Fusion: EO® Citrus Fusion Shower Gel gently cleanses with pure essential oils & organic herbal blends to soothe & nourish the skin. The proprietary EO® Exfoliation Complex harnesses key fruit and flower Alpha Hydroxy Acids (AHA) to gently remove dull damaged skin revealing the radiance beneath. This richly foaming Coconut Oil Cleansing Complex gently cleanses without drying. Glycerin, Allantoin, and Panthenol, natural humectants and moisturizers, hydrate and nurture skin. Organic Tangerine, Orange, Mandarin, Orange Blossom and Lemon combine with Organic Vanilla to create the heart of this healing and exfoliating Fusion Blend. EO® Exfoliation Complex utilizes Alpha Hydroxy Acids (AHA) of Grapefruit, Pineapple and Hibiscus naturally exfoliate dull skin and restore new youthful skin radiance. Vegetable Glycerin, a natural humectant, attracts moisture to skin to maintain optimal hydration balance. Allantoin, from the comfrey plant is renowned for its ability to soothe, heal and regenerate skin cells. Naturally derived plant Panthenol (Vitamin B) is naturally hydrating and deeply penetrating to add essential moisture and smooth skin surface. Organic Calendula, Chamomile and White Tea botanicals harmonize and replenish skin. Rich Rice Proteins deeply penetrate supporting new skin. pH Balanced and Biodegradable coconut cleansing complex creates a gentle foam to clean naturally. Vitamin A, a powerful Antioxidant, improves skin health. EO Shower Gel, Grapefruit & Mint: Gently cleansing with pure essential oils and botanical extracts. Fresh squeezed. Our Grapefruit Essential Oil is cold pressed from the skin of the fruit to preserve the refreshing, citrusy aroma. We acknowledge the interdependence of all things. We lead by example without perfection. We put people and the planet before profits. We believe that transparency creates trust; we are committed to transparency throughout. We engage with each other and our world in a kind, candid and respectful way. We choose to serve our world by way of mindful actions, everyday. When you find a company whose core values match your own personal values, you can purchase and use their products with a clear conscious. That’s how I feel about EO! What are the benefits that you can get from health supplements and natural beauty products?